I have a 70 year old client who rocks my style world. She’s about 5′ 8″ with short black hair and mesmerizing light green eyes and fair skin. Her pretty body is pear shaped, short-waisted and a size 8 or 10. She adores Ralph Lauren, jewel tones and sleek lines. This is one of the relaxed outfits we put together last week. My client loves the look because it’s casual yet polished, comfy yet tailored, colourful yet clean. 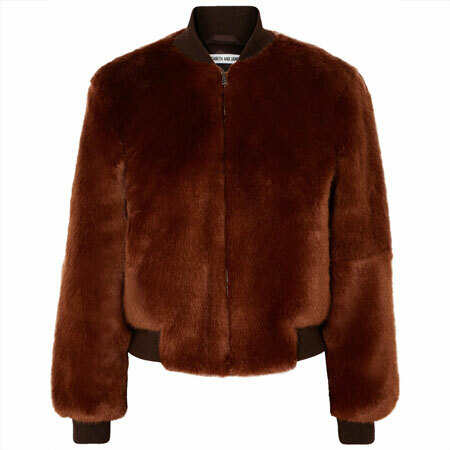 And above all flattering, versatile and appropriate. It can take her from running errands in the morning, to lunch with a friend in the afternoon, and right back to babysitting grandkids at night. 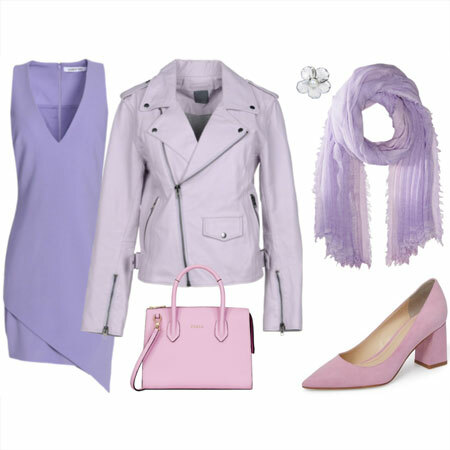 Apart from the scarf, which is similar in colour and shape to the one we chose, the rest of the items shown are the exact same items that we used in my client’s ensemble. 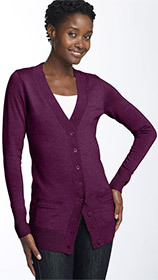 We layered a camisole under a shawl collared knit top and topped it off with an unbuttoned purple boyfriend cardigan. We tucked a dark pair of Gap Real Straight Jeans into a pair of impeccable flat Via Spiga riding boots (weather proofed with spray). We accessorized with a soft voluminous printed scarf and kept the knot vertical to accentuate a long lean line. To finish, we added arty silver earrings and bracelet, a black patent satchel, and structured trench coat plus umbrella to combat the elements. The tunic length of the boyfriend cardigan, worn open with a long elongating scarf, helps my client feel less exposed around the hip and thigh area once the trench comes off. Tucking jeans into boots helps ground the outfit. The low colour contrast between the top and bottom makes my client feel pulled together and chic. Of course, high contrasting colours are chic too, but this client prefers low contrasts. The green in the scarf brings out the green in her eyes. The outfit is fabulously modern classic, simply stylish, and ever so practical for a wet and cold climate. The most interesting thing of all is that it looks great on my 70 year old client, I would wear it at 40, and so would a classic 25 year old lass. Versatility at its best. Fab outfit. So simple but so put together. Love as ever the styling tips and wisdom. Your client sounds amazing! Yep. I wear outfits like this all the time, and I am in my 40s. I’m actually not a big fan of the boots-over-jeans look, but the rest of it looks like it could have come out of my closet. Thanks for this Angie – I’m *only* 46, but this has essentially been my uniform lately. It’s nice to hear you articulate why it’s working so well for me. And I needed a little something more for my 76-year-old mom, and that scarf is *it*. Phew! Gorgeous outfit. I would absolutely wear that at 35!! Love the outfit, and it is so similar to what I wore once this week while volunteering at my son’s school. My outfit comprised of similar items, yet with a black cardigan and a little chunkier black/red/purple scarf that my friend wove for me. Good to know I was right on with my combo. Love this post!! If my sizes were available, I’d be ordering everything right now! ( I looked). This is close to a uniform for me in cold weather except for finding the right boots. Those are exactly what I want, but with a narrower calf. I’m glad to see I’m on the right track. The boots I’ve been wearing most are actually low heel over-the-knee, a look new to me. 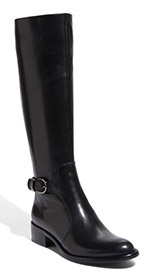 Would your 70 year old client wear over-the-knee boots? I’m still a bit self conscious in them at my age (64). This post is so helpful! The pieces you describe are my winter uniform (cardigan, black knit pants or dark skinny jeans tucked into flat boots, but worn under a belted puffer coat). My personal weakness is not knowing how to accessorize basics to make the outfit interesting. Big scarves can feel contrived to me. I need to feel more confident about accessories. Does anyone else feel self-conscious dressing up basics? What a great post, Angie! It’s great to see how you put a head-to-toe look together for a client and what occasions it covers. I love this particular outfit as well. Very inspirational. Fabulous post, Angie! True classic style is indeed AGELESS! That outfit is perfection. I would SO wear that! So true Angie! I wear this look frequently (but with a bit more of a heel for the boots) and I’m 23. I hope tucking jeans into boots doesn’t go out of style, because I don’t ever want to stop wearing this look! Though a cami, knit top, cardi and scarf are an awful lot of layers. Such a helpful post Angie. I am gathering ideas for a Dec. 27 trip to NYC to see the Christmas lights with my hubby. I may need more warmth. 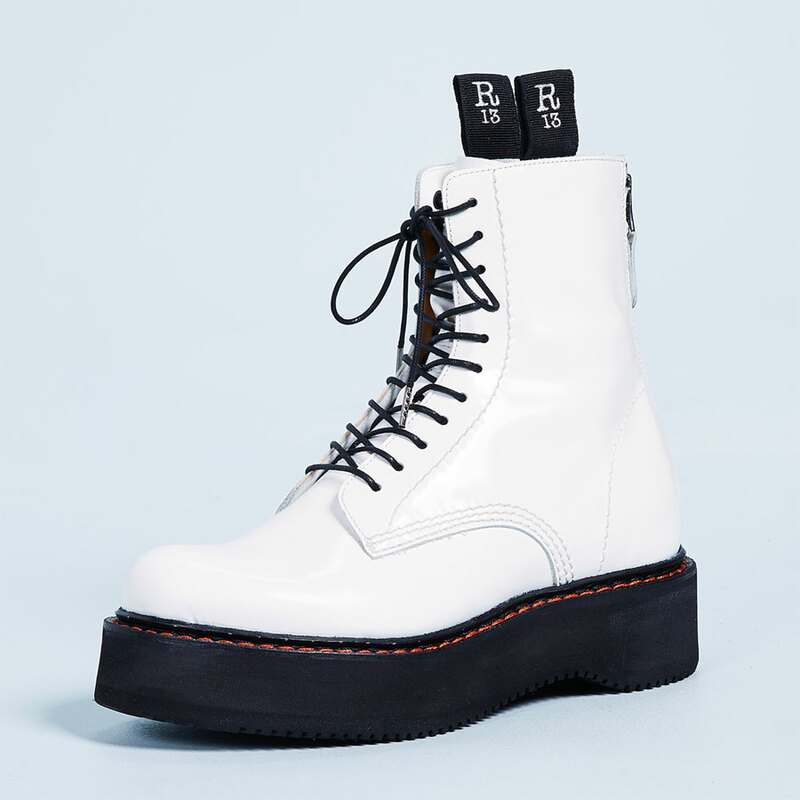 I have discovered Le Canadienne boots for the ultimate walking comfort. If you have any other tips, send them my way! I would wear this outfit in a heartbeat (at 32). One reason I really like it, is all the layers, leaves room for adjusting to a hotter room if needed. Plus I always find outfits with a couple of layers more interresting to look at. This is pretty much my fall, winter & spring uniform — you are so right that it’s extremely versatile & polished. I think the “3rd piece” concept of adding the scarf (in this case it’s the 4th piece but you know what I mean) is what adds the finishing touch to the outfit. Wondering though, Angie, why you say a low-color contrast between top & bottom helps one look more chic. Are you saying that monochrome (or analogous color combinations) communicate chic & sophisticated more than bold contrasts? I ask, because I tend to favor triad combinations, such as purple/green w/orange accent, or peach/coral w/a green accent, for more interest. Does that mean while it’s perceived as fun, it’s less sophisticated? Thanks for commenting on this! I love color, but as someone in her late 40’s, I don’t want to be perceived as trying to dress too young/elementary-schoolish! Yup, I have been wearing a near replica (substituting a wool coat for trench) of this combo quite often! The only thing that doesn’t work for me is the cardi over a full-sleeve knit top – too bulky for me. Love the colors!! Tara, you hit the nail on the head. With more dramatic accessories, you’ll change the flavour of this ensemble. Lisa, your point about switching up layers is a good one. Georgia, why do big scarves feel contrived? They are an absolute practical necessity in cold weather and in my opinion – much more fun and hip and dainty small scarves. In fact, if I had to choose, small scarves look more contrived since they are purely decorative and not very functional. Kate, tucking jeans into boots is a great 70’s look and totally mainstream. I can’t imagine that it will go out of style. Joy, the right flat OTK boots are fabulous on a 70 year old. Please wear yours! I would wear this outfit in a heartbeat! I actually do very often with different elements of course. Thank you for the beautiful instructive visuals Angie. I’m also in my mid-twenties and would wear this exact outfit in a heartbeat. My own fall-back casual outfit formula is nearly exact to this. What a fab post. I hope I’ll be this stylish when I’m 70. Great outfit. Truly ageless! In fact, it’s remarkably similar to what I wore to a casual family get together this weekend- a purple 3/4 sleeved sweater topped with a black cardigan left open and paired with a scarf on top and dark jeans tucked into tall black boots on bottom. And I’m 29! A fabulous formula, Angie! 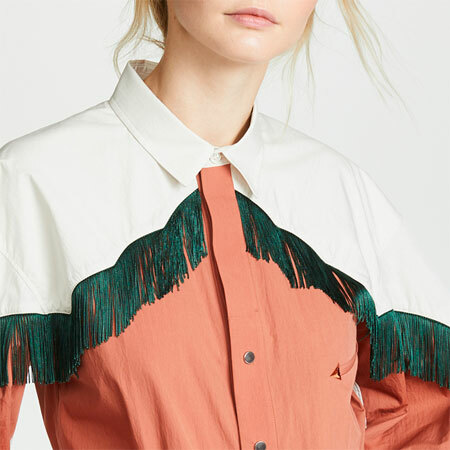 Something I would wear in a heartbeat if I had the requisite pieces (thanks for the reminder to get riding boots). Thanks to you and your client for proving that style is attainable at any age! Oh, how Fabulous!! I love the splash of color in the cardi and scarf!! This is pretty much my rainy day/ off work outfit!! I love this post! Breaking down the elements like this in an outfit helps newbies and veteran YLF’ers alike to easily emulate the look. This is a “go to” type outfit for me, so I love to see new examples. Thanks, Angie! Yay for your client! She looks fab! The details you provide are so instructive. Not just “wear a scarf and cardi,” but *how* to wear them. A great post and a cute outfit! Thanks for inspiring me to get a couple of layering tops with a little style. I tend to go plain with my cami’s and long sleeved t’s; however, it’s not really my personal style. My favorite outfits include my v-neck lace camisole from White House Black Market. That said, the long sleeved Caslon t’s from Nordstrom that you recommended a couple of months ago are great. The item has been on my shopping list for a long time and is now crossed off, Thanks! I am also 5 feet 8 inches and wear a size 8. I will be 60 next month and would/will absolutely wear this. Thank you. Thank you. I am 30, and I would totally wear this! I could also totally see myself wearing this in 40 years. I think this is a fantastic outfit that appeals to all sorts of style types and body types… love the big scarf and the jewel tones. Love the outfit I have got to have that scarf. I love that long cardi…..never knew it existed until I read your blog. Of course I love skinnies and boots and like your client I too plan to wear ultra stylish clothing at 70! Thank you for posting ideas like this. I am such a newbie to this whole idea of personal style. You are giving me a lot of food for thought. I appreciate that not everything is aimed at businesswear or dressy. Being a 40-something SAHM I find the casual information very useful! That? Is fab times a million!! 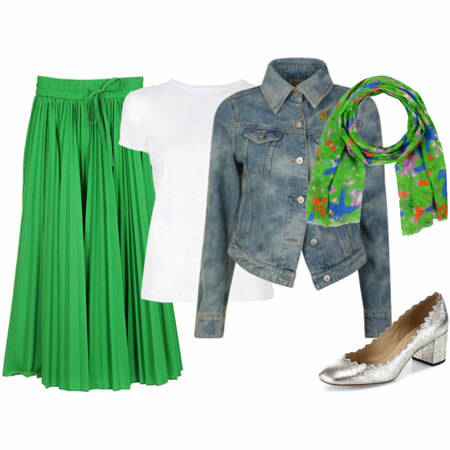 Angie, this is my go-to, feel good outfit, and one that feels true to my style. I hope that I will still be working this look when I am a stylish grandmother in about a decade or so. Heads up: that fabulous cardigan was on sale at my Nordstrom this past week… for anyone who wants to brave “brick and mortar” . I didn’t buy, only because the sleeves, over anything but a tank, were a pretty tight fit.. I love the look Angie. Thank you for the pictures and describing how this works. It’s good to know that these things don’t have to be complicated. As I go along I am seeing the beauty in simple easy clean lines. Yup, I could see myself wearing this exact outfit at age 25. 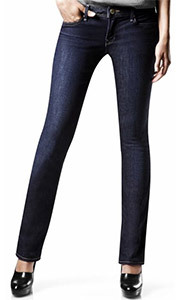 In fact, I wore those very Gap straight jeans today tucked into lace-up knee boots. I just realized the wisdom in having the dark hair, dark top, dark jeans, and dark boots to create the long unbroken line, and then add the next layer whether it be a cardigan and scarf, or a blazer and necklace. This will make dressing much easier for me. Thank you for breaking down the whole for us. i’m a slow learner. This is one of my favorite go-to looks, except I usually substitute a short jacket or cardigan for the boyfriend cardigan. I am 5’1″ and I’m kind of afraid of long sweaters/jackets – is there a way for shorter women to wear longer layers without looking overpowered? Thanks! Rachel, by all means try the Real Gap Straights in an ankle length for your petite height. Bevs, shorter women can totally wear longer layers and not look like they’re drowning in the fabric. Just keep those longer layers a little shorter to create a balanced effect. Great post, Angie! I love how you broke down the outfit for us and I would certainly wear this. I actually bought those boots last month but ended up returning them because they were too wide for my calves. I’m still looking for the perfect pair of riding boots to complete this look. I would love to see more “Ageless Dressing” ensembles! Another admirer of this look here! But I also would like to know the proper length for a boyfriend cardigan on shorter ladies like me. I’ve kind of stayed away from them because of this. Great ensemble Angie, Love it! Wish it would work for me….unfortunately, southern Calif. climate is to warm for this lovely group (or would only be possible for a day!) I too love seeing more “ageless” styles. Like so many others- this is practically a uniform for me. One of my favorite switches with this style is a denim pencil skirt and slouchy suede boots. Perfect for the mild AZ weather but I feel snazzy enough for dinner and a movie. I’ll also skip some of the layers. Out here we still might hit 80, so sometimes it’s just a t-shirt or light v-neck sweater with a scarf and great handbag. Have you ever done tutorials on scarf styles- like you did with your pearls? I am always interested in learning new ways to utilize my collection. I have such a vivid picture in mind of your client wearing this outfit, does she read your blog? Thank you for introducing the concept of the ageless outfit to me. So true! I an 27 & I LOVE that outfit! I may even go do some shopping today…. Love this outfit. I think it is timeless and ageless. It takes basic pieces and lets you add your own spin to it. I don’t like the boots over skinny jeans at my height (5’2″) but I could see swapping out the jeans for a short black skirt and black tights and then the boots. I also feel overwhelmed by scarves a lot of the time…but that’s the point, isn’t it, to take the basic look & adapt it to our own lives, ages, bodies? Absolutely adore this look Angie. I end up wearing some version of it half of the time in the winter, since it is perfect for my casual work setting, yet hip enough for me to feel like me. So i change the boots, the shape of the cardi, the neckline of the top etc, but the basic formula is still there. I’d wear any and ALL of that in a heartbeat! Do you have pictures of said client on your pinterest page?